Leonardo da Vinci carried his little painting of the Mona Lisa in his luggage when he traveled. He is said to have kept Her on his bed stand and, until his death, was never parted from his most famous painting. Mona Lisa shares an important feature with the High Priestess Tarot Key. She sits between two pillars. Only the pedistals may be seen in Leonardo’s original painting. Though early copies were made depicting the columns in full view, Da Vinci’s painting shows only a glimpse of their pedestals. Yet the pedestals that flank the Mona Lisa clearly support the concept of columns. The image of a woman, flanked by two columns, is a familiar configuration in Hermetic Philosophy. The basic structure that makes up the Tree of Life consists of three pillars. 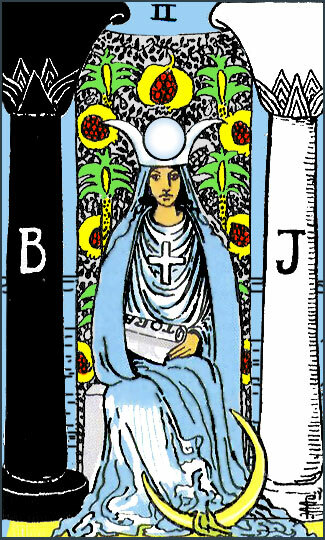 In the image of the Tarot’s High Priestess the woman between the two pillars represents the central pillar, or the eternal dimension within the Tree of Life. Like the Mona Lisa, the High Priestess sits placidly between two architectural pillars… her hands, and a book, are in her lap. If you look closely at the arm of the chair in Da Vinci’s painting, you will notice the distinctive shape of a closed book. Mona Lisa’s fingers curve gracefully over the edge of the pages as though she had just left off reading, closed the book, and looked up at the artist. The worship of the virgin Mary in the West is the adoration of the same archetype as that presented by The High Priestess. The High Priestess is associated with knowledge and learning, especially spiritual knowledge. 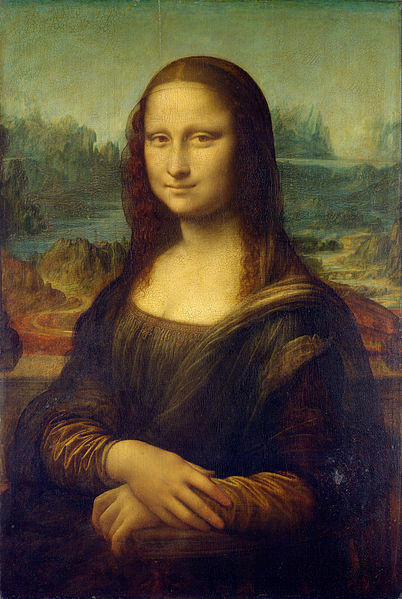 Mona Lisa’s enigmatic smile has long been associated with some secret, or unspoken knowledge. The otherworldly glow of her skin suggests the temporal beauty of a spiritual agency. These qualities, and the painting’s composition, tell a Cabalist that we are looking at the High Priestess. The archetypal identity that Mary Magdalene and The High Priestess share is also reflected in the Mona Lisa. The name Mona Lisa, as an anagram, combines Mary Magdalene’s signature M with ona. The word Yoni has other cognates and John has other names: yona and yones are other forms of the word yoni. The name John appears also as Johanna and Johannes in Renaissance Art. The second part of her name consists of L and isa. The Hebrew name for god is El. L becomes the signature letter for god as Isis, who is also deeply identified with beauty and sacred sexuality. The provacative use of the singular artical THE refers to either The Magdalene or The Mona Lisa. For these reasons, and because of da Vinci’s deeply personal relationship to the painting, I believe that the Mona Lisa is a portrait of the Magdalene of Leonardo’s time. Clearly he guarded this secret as carefully as the painting itself. Leonardo called her La Gioconda; Lady of light. The Magdalene, also a Lady of light, stands as a Tree of Life in holy trinity; Great Mother on the left, and Sister on the right. Below them, at the Tree’s center… the energies of Mother and Sister are received in Beauty, the earthly daughter of heaven. They form together a vessel of light within the Tree of Life. Radiant energy travels through space without light. When it comes into contact with water… it shines. Such is the nature of the living water associated with The Tree of Life. These waters live in Ishtar, in Isis, and in Beauty. These are some of the names of Love as goddess, and tree, and as a fountain of living water. In Revelation the Tree of life is imaged as a throne. Beauty, as the Lamb in the midst of the throne, leads us to those living fountains of waters. The Magdalene and the High Priestess, as the same archetype, also share an identity with Isis and with Ishtar . Ever living waters pour from the jar that Ishtar holds. Such waters pour forth from the robe of the High Priestess and flow, as vital energy, through the rest of numbers of the Major Arcana. The female chevron, on the Tree of Life, is the sacred vessel that holds the waters of life. This image on the Tree represents the true and Holy Grail of Hermetic Philosophy. The waters that it contains are living waters. Through these waters, the light of god shines forth. This vessel, in the shape of a V, on the Tree of Life represents the Sacred Feminine as yonic cup. The word Yoni is ancient. The Sumerians used this word in their famous Hymn to Inanna (see extended quotes from this hymn in my post Wedding Day) The word may have traveled from India to Sumeria when the pre-Harapin culture fled from glacerial melt waters that flooded India’s West coast about thirteen thousand years ago. In any case, the word Yoni, as the sexual and generative aspect of woman, has long represented the sacred source of life. The sacred yoni as temple of joy and vessel of god had a central place in Jerusalem. Zion, the place from which god shines forth, is another word for yoni. In hebrew the word is not Zion, but Si ‘yon. Yet have I set my king on my holy hill of Zion.